It’s an exceptionally obnoxious day to be conservative in New Orleans, and it all centers around Mardi Gras beads. It was an innocent bit of fun that conservatives (the few that are left in the city) could enjoy during Mardi Gras festivities. After all, it’s not like the left hasn’t taken advantage of Mardi Gras to get a political message across every now and then. But some members of the New Orleans left couldn’t abide conservatives having some fun and making a statement, and among them was NOLA.com columnist Jarvis DeBerry. Look, I’m not surprised DeBerry wrote a column about how much he hates people who like Confederate monuments. That would be like being mad that New Orleans has a poorly managed government, what else would I expect? 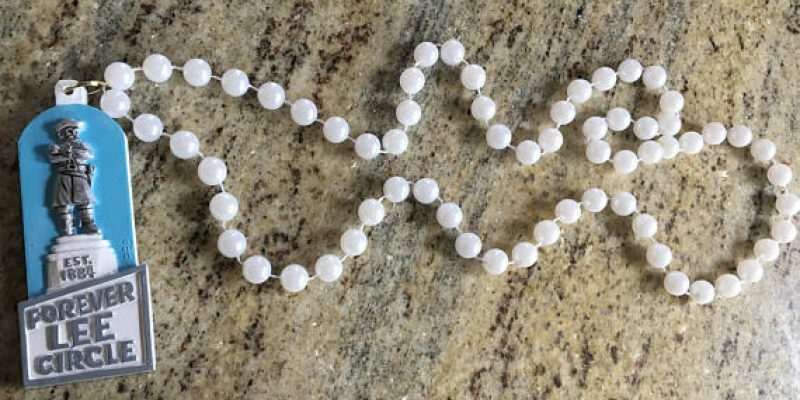 Like the monument whose removal they bemoan, the “Forever Lee Circle” beads that some revelers are planning to throw for this year’s Carnival are tailor made for losers. Only losers would purchase them as throws, and only losers would want to catch them and take them home. The Robert E. Lee monument itself honored a loser to make other losers feel better about losing. The same is true for monuments to Jefferson Davis and P.G.T. Beauregard. Those monuments gloriously depicted losers so the losing side in the Civil War could maintain its delusions of grandeur and supremacy. The monuments were the embodiment of that old aphorism: If you can’t beat ’em, put up statues that pretend you did. Or could have. Or should have. Or will eventually. Jarvis my dude, I don’t know if you know this, but your side won. The monuments are gone! You’re acting just like those conservatives you hate that talk about Hillary Clinton all the time. In fact, your movement is so widespread that people are even defacing statues of the Star Spangled Banner now, you should be elated! But I guess that isn’t enough for Jarvis. We need to have an Orwellian New Orleans where people can’t even have the thought that the Robert E. Lee statue was an important New Orleans cultural artifact. To his credit though, DeBerry hasn’t been the worst offender. 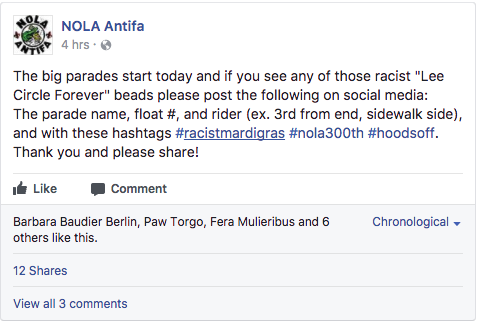 NOLA Antifa has apparently gotten involved with this, and is not tolerating any Robert E. Lee beads. 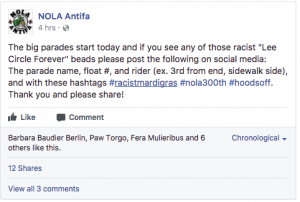 That’s right, these people are going to be walking up and down the streets of Mardi Gras just itching to find a Lee Circle bead so they can sneak a picture and write a thousand hashtags on social media to share their fellow social justice warriors. The fact that they’re asking for the picture taker to identify the float rider is especially disturbing, since it means that they’re most likely trying to figure out the identity of said rider and blast their information on social media. If you supported taking down the monuments last year, maybe this is a good time to reflect on who else wanted them gone. People like this are cultural totalitarians who want any suggestion of wrongthink taken out. They’re also part of the reason NOLA is becoming a worse place to live. Previous Article Are Russian Fish Bad for Louisiana waters?